His House > Blog > Mental Health > Is There a Connection Between Mental Illness and Addiction? Is There a Connection Between Mental Illness and Addiction? Addiction is a chronic disease in itself that has a complex range of causes. Someone with mental illness can be at higher risk of developing a dependence on alcohol or drugs and on the flip side, others already with addiction issues can suffer associated anxiety and depression that might appear indistinguishable from mental illness. In both cases, mental illness and addictive disorders require separate diagnosis and treatment for effective recovery from both at a mental health inpatient treatment center. If no treatment is received, one disorder can become more heightened than the other over time which can lead to further complications down the line. This is a more severe form of depression that something suffered as a result of a medical condition like thyroid disorder or triggered by grief on the death of a loved one. In many cases, sufferers of clinical depression will attempt to mask symptoms through substance or alcohol abuse and over a period of time, become addicted in attempts to self-medicate. 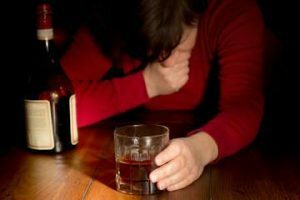 Mental health treatment centers report that female addicts are more likely to have depression before using alcohol and drugs, although it also occurs in males. As suggested by its name, this disorder is characterized by mood swings from one extreme to the other – mania to depression. Sufferers report periods of feeling euphoric, restless, impulsive and overly energetic when in the mania phase only to come crashing down to the depths of depression almost instantly and without any sense of being in control. Although the patterns of highs and lows can vary from person to person, either the mania or the depression cycle of bipolar disorder can trigger addictive behavior and a need to self-medicate with alcohol or drugs. Anxiety is one of the most common behaviors associated with addiction and is a personality disorder or mental illness that is exacerbated in most cases through alcohol and substance abuse. The main reason anxiety perpetuates addiction is because medicating with drugs and alcohol can give someone respite from the very real physical symptoms, albeit temporarily. Over a prolonged period of time of medicating anxiety with alcohol and drugs, it can become a coping mechanism for someone and a response to certain situations and circumstances in their daily lives. This inevitably buries the issue of addiction further, making it harder to seek treatment at a mental health treatment center as time goes by. As with depression, some people who abuse alcohol or drugs display symptoms not dissimilar to schizophrenia, leading many to believe it causes the mental illness. As a result, those with diagnosed schizophrenia are often mistaken for being affected by drink or drugs. However, it is now widely accepted that drugs and alcohol do not cause schizophrenia, although those with the condition are at much higher risk of developing addiction issues as a result of the illness. Some drugs like cocaine and marijuana are known to make the symptoms of schizophrenia worse and research shows that sufferers are less likely to follow their treatment plan if they are abusing drugs. The psychotic symptoms of schizophrenia include hallucinations and delusions, which can often lead sufferers to turn to drugs or alcohol to alleviate these. Attending a mental health residential treatment program is the best way to approach addiction issues for those suffering from schizophrenia. It can be extremely difficult to distinguish the symptoms of addiction and mental illness although it is essential before devising the most appropriate treatment program. Someone has to have completed detox and be substance-free for at least two weeks before the various symptoms can be identified. Once a dual diagnosis has been made at a mental health treatment center, the addiction and psychological symptoms both have to be treated separately but concurrently. Without full and comprehensive background study into each individual patient on rehab programs, misdiagnosis or under-treatment can occur, particularly if alcohol or drug addiction is masking a mental illness. It is only by treating the two illnesses together that the process of unraveling the underlying causes can be begun. Mental illness and addiction both influence each other, however, what needs to be determined is which condition existed first. This requires considerable consultation and communication between care providers and sufferers at an inpatient mental health treatment facility. An integral part of effective addiction treatment is to identify, recognize and confront the underlying causes in order to remove the delusional behaviors that perpetuate the disease. Whether causes of addiction are found to be mental illness or conversely, they are the effects created as a consequence, both are conditions that require separate, specialist treatment in a mental health inpatient treatment center. His House Rehab offers industry leading Mental Health Treatment Programs . We were founded in 1994 and we base our Drug and Alcohol Treatment programs on five key principles: commitment, honesty, integrity, respect, and service. These five principles guide us in all that we do and all the care we provide. Contact us today to see how we can help you or your loved one at (888) 681-4594.